« Astoria OR Holiday Concerts 2016: Sounds of Christmas! 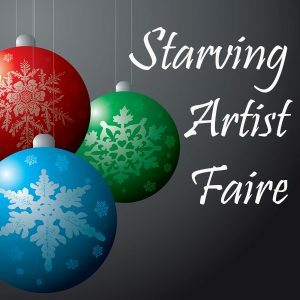 If you like to give unique holiday gifts, don’t miss the Astor Street Opry Company’s 21st annual Starving Artist Faire on December 2 – 4, 2016! Enjoy the Faire’s festive atmosphere with musical performances and holiday treats while you peruse items created by over 50 talented artists and artisans from the Pacific Northwest. You’ll find one of a kind gifts and fine art crafts ranging from photography to paintings to pottery, plus jewelry, clothing, and more. Not finished decorating your home for the holidays? You’d better watch out, since Santa will visit the Faire both Saturday and Sunday from 10:00 am until noon. Don’t worry, you’ll stay on his ‘Nice’ list when you choose from the great selection of wreaths, candles, and holiday décor that are sure to please both you and Santa! The Starving Artist’s Faire is held at the Astoria Armory, just a short 10 minute walk up Exchange Street from Clementine’s Bed and Breakfast. You know that Judith’s delicious breakfasts mean you’ll never leave the B&B hungry, so don’t let Astoria’s artists starve either! Give us a call at the inn or go online and book your room today. Don’t miss one of Astoria’s most festive holiday traditions! This entry was posted on Thursday, December 1st, 2016 at 7:34 pm and is filed under Clementine's Bed & Breakfast News, Events, Holidays. You can follow any responses to this entry through the RSS 2.0 feed. Both comments and pings are currently closed.